The Atlantic Ultra-Lite 3-29" Expandable Spinner features a retractable, aluminum-grade extension handle which has two stops at 38 inch and 42 inch, allowing a comfortable roll for users of different heights. It also features 360-degree 4-Wheel system on spinners to roll effortlessly in any direction and easily maneuver through ticket lines and crowded airports. Other features include durable crash-guard protective wheel housings, skid bars and molded rubber corner guards provide protection. 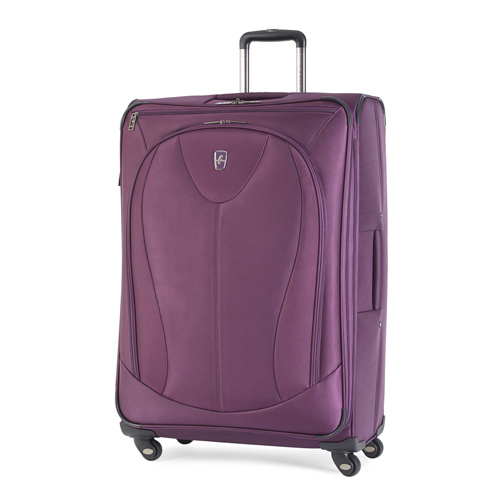 The Atlantic Ultra-Lite 3-29" Expandable Spinner is extremely lightweight spinner for families on the go which is made up of durable material high-density polyester fabric with water repellent coating providing protection from water and stains. - w/ Two Stops at 38" & 42"
The Ultra Lite 3 - 29inch - Purple has many exciting features for users of all types. You can extend the lifetime of your Ultra Lite 3 - 29inch - Purple with the purchase of a FactoryOutletStore Factory Protection Plan. The Ultra Lite 3 - 29inch - Purple is sold as a Brand New Unopened Item.